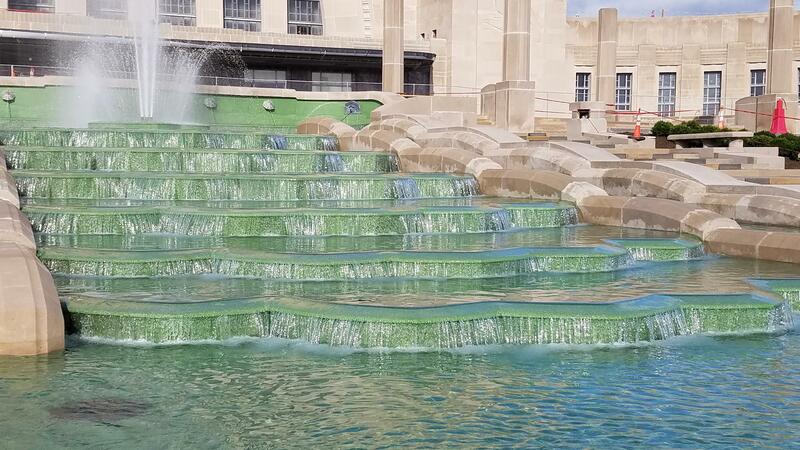 The Cincinnati Musuem Center is showing off its new and improved fountain Thursday. 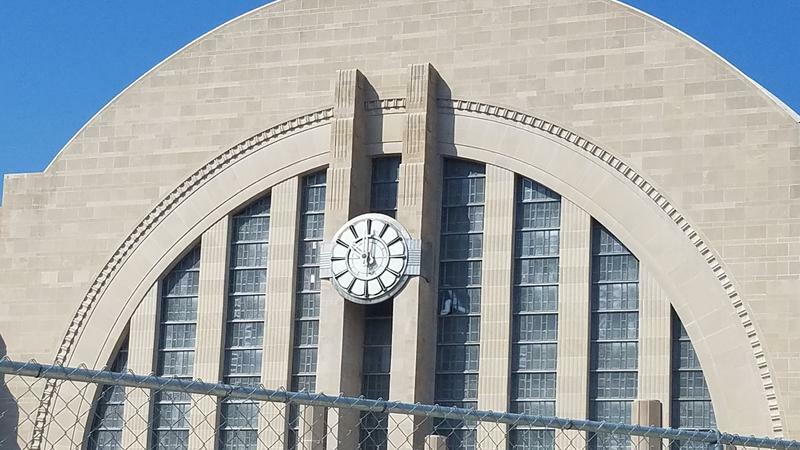 It was reconstructed as part of the Union Terminal restoration set to conclude in November. The entire fountain and front plaza were removed during the restoration in order to make structural repairs to the roof of the Children's Museum below. The limestone portions - like the Art Deco light fixtures - were stored, restored and put back in place. The fountain was rebuilt to the same specifications using new terrazzo. "Most of the plaza was removed in the 1980s when the building was made into the Museum Center," says Project Architect Nick Cates with GBBN Architects. "But the fountain itself had never been removed, so it still had the original waterproofing underneath and a lead pan that was like a secondary waterproofing under the fountain itself." That waterproofing wasn't very successful and the roof needed significant work, including adding new steel beams to replace the existing ones with 84 years of water damage. The damage was worse than expected, forcing an unplanned closure of the Children's Museum in November 2017. The plaza now sits atop a slab designed to protect the museum from the elements and any potential fountain related leaks. The original fountain was designed by Fellheimer & Wagner, according to the Cincinnati Museum Center's unofficial building historian Nick Massa. The Cassini & Martini Terrazzo Company crafted the recognizable green terrazzo finish. An image from 1932 shows the fountain under construction. Union Terminal opened in 1933. "The area that is now our parking lots was a city park, Lincoln Park, which had a pond which people could rent boats on and swim in," Massa explains. "The park was completely cleared for the new project and the area re-landscaped, and the pond filled in. It is believed that the fountain was included in the design to continue having a water feature in the new 'park.' "
While the fountain looks the same, the plumbing beneath is completely new. In 2015, WVXU took listeners two-and-a-half stories below the fountain to see how it worked. A giant blue make-up tank held 15,000 gallons of water and 26 pipes fed the individual spouts. The fountain's center geyser was manually controlled by a wrench-lever that required an engineer in the pump room communicating by radio with person above ground to determine the spout's height. The big blue make-up tank at left once held 15,000 gallons of water for recirculating through the fountain. The tank is now gone but the concrete pad where it stood remains. The large, bottom basin of the new fountain now serves as the make-up tank, eliminating the need for a storage silo in the pump room, though you can still see the round cement base upon which it stood. The fountain holds 44,000 gallons of chlorinated water. The spouts are still individually fed, but the pipework is new. 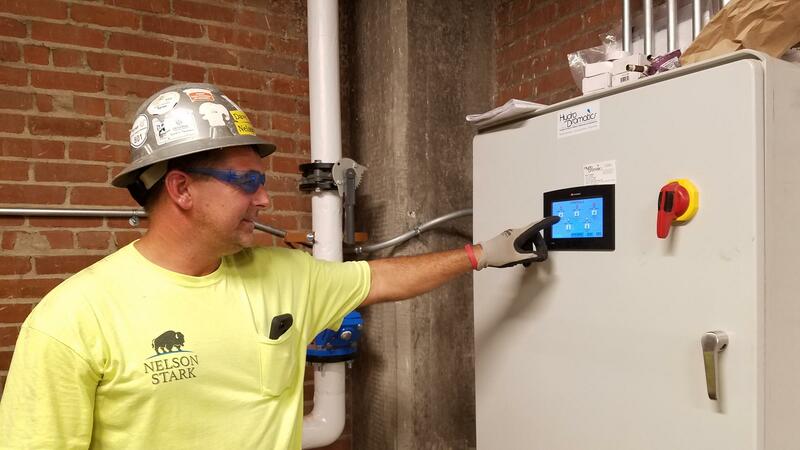 "We moved the piping up above the (new) waterproof slab" says Dave Swope, site superintendent with The Nelson Stark Company, which specializes in commercial plumbing. Part of the water damage problem came from pipes running through the building under the prior waterproofing elements. Nick Cates says leaks likely weren't a concern for the original builders because the space below was a parking garage. The old pipes and pumps (at left) have been replaced, though the general operational outline remains. "In all honesty," Swope says, "it's a very similar situation with the exception of the tank. It's a very simple system. There's one pump that handles the seven-jet centerpiece ... it gets that pressure up there because it can shoot quite high." Two more pumps feed pressure to a header with valves for the individual spouts around the fountain's edges. 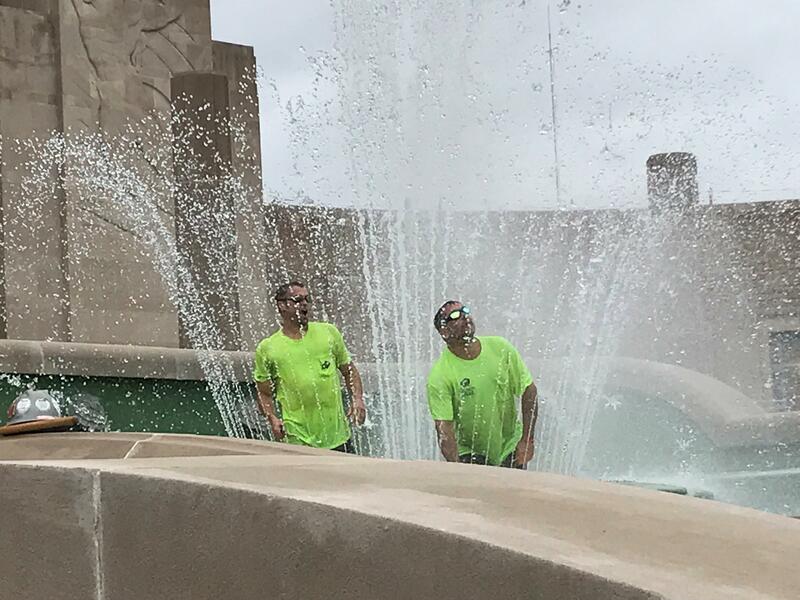 "We had to get in there and clean the nozzles out, re-aim them, and the only way to do that is with the fountain running," says Dave Swope (left). "There's no way to get it exactly right unless you're in there." Swope estimates the center "flower" could reach 80 feet in the air if turned all the way up. Don't expect to ever see the geyser shoot that high, wind gusts would drench everyone and everything near the plaza. 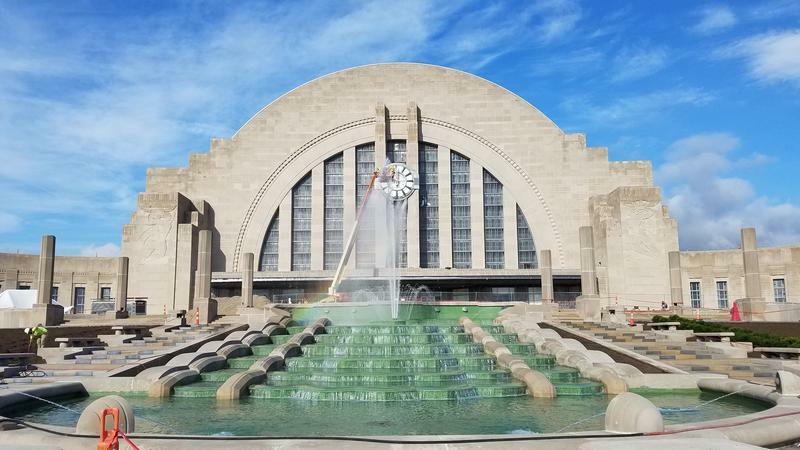 In 2015, Museum Center Chief Engineer Mike Reed told WVXU the center spout was usually kept at about 12 feet high, but it could be turned down - by hand - as low as three feet or as high as 100 feet. Engineers used to control the height of the center spout manually with a wrench and a valve. The new system is computerized and can be controlled with a mobile app. The fountain is now run by a computer. Museum Center engineers, Swope explains, can program the fountain to regulate its height based on how hard the wind is blowing or other conditions. Swope says there's a wind meter on the south side of the building. "The fountain height will move around. It'll go up ... On still days in the summer when there's no wind, it'll go higher." While the plan is to set a schedule and let the fountain run itself, it does come with a mobile app engineers can use to manipulate the various spouts. Once controlled by hand, the fountain is "smart" now. Dave Swope demonstrates how the fount can be adjusted from a screen in the pump room. The fountain's original brass fixtures were spruced up, but the basins are reconstructed from concrete and new green terrazzo, a composite of marble, granite and other similar materials. "The terrazzo that you see today looks almost exactly like the original," Cates says. "It's a really good match." He says it may look a little different than in recent memory because layers of a substance similar to a pool finish have been added over the past 30 years. "Before the reconstruction project started, the color was off." The recognizable green basin color now comes from new terrazzo (at right) created to remain watertight in the future. The previous basin (at left) was coated with layers of swimming pool-like liner material. Lots of testing was done to determine the best waterproofing and terrazzo finishes. "We did color tests as well. ... Different colors, different pigments and different aggregate to try to get the color to match," Cates says. The plaza now features multiple colors of concrete creating visual interest. This, too, is based on Union Terminal's original plans. The old concrete was replaced over time, not always following in the original colors, or with subpar materials that didn't preserve the hues. Cates says the new concrete is tinted all the way through to prevent that problem. The rebuilt weirs now cascade more evenly. Visitors may notice another slight difference. The fountain's cascading weirs are straighter and more level. "If you stand at the bottom and watch the water flow over, it's much more even," Cates says. "Before, it came down in little streams and wasn't always perfectly level. But in any type of pool where you have water coming over the edge, it needs to be level so the water's the same thickness so it falls over the edge." There is one way in which the fountain can't be completely returned to its inception. Unofficial historian Nick Massa notes "the scallops were badly damaged in the 1970s ... and some of the decorative covers over the lower sprays were removed." 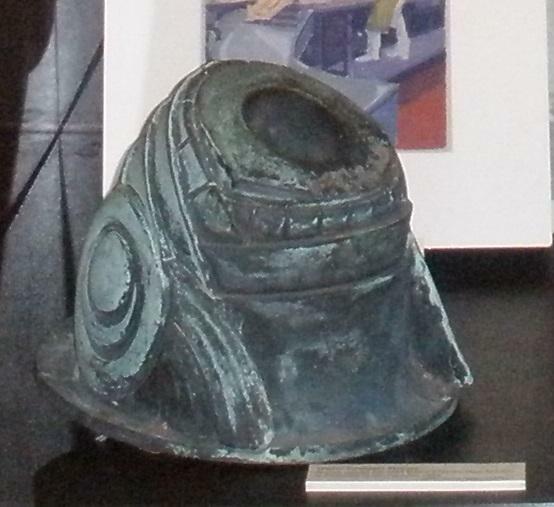 The original bottom basin spouts were removed for some reason in the 1970s. The whereabouts of just one are known. Massa says it's unclear why the covers were taken off or who did it. The work happened as the train station was being modified into a shopping mall. The museum knows the whereabouts of just one cover, it came into the museum's own collection several years ago, Massa says, after being loaned for an exhibit. Built at the same time as Union Terminal in 1932, the fountain in front of the iconic train station echoes the famous art deco design. 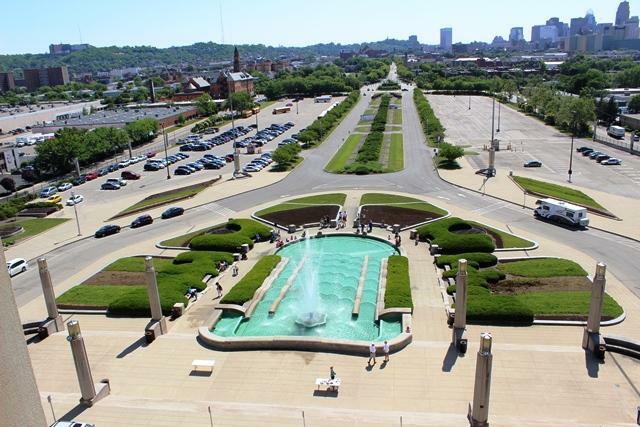 Cincinnati Museum Center officials say the return of water to the fountain is an annual rite of passage signaling the beginning of summer. 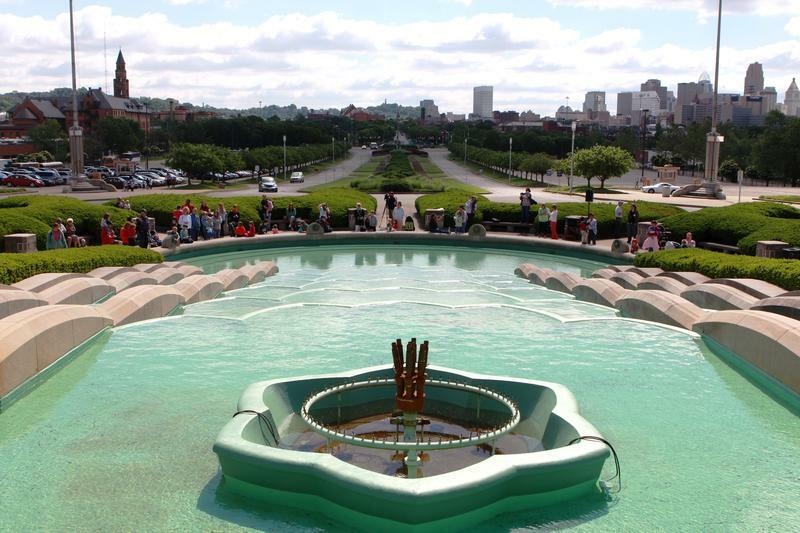 For three years the Cincinnati Museum Center has invited the community to participate as the water is turned on for the summer in its iconic fountain. Museum members and guests gathered Friday morning as the countdown began. Sarah Bowman and her 2 1/2-year-old daughter Mimi of Fairfield waited patiently to the sounds of Jimmy Buffet music. Staff members passed out temporary tattoos to the children.